According to the Citrograph, construction for the Poundstone and Hamilton Building began in mid-1898, and was completed by the end of the year. 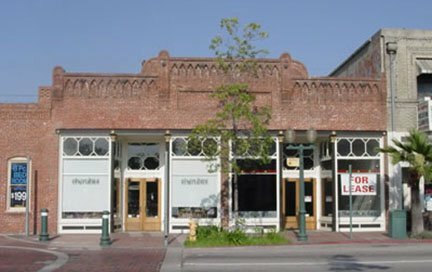 The one-story, double-storefront brick building was constructed of sufficient strength to accommodate a second story in the future if the owners deemed it appropriate. A second floor was never built, and, in fact, the Orange Street façade has changed little over time. In fact, after the recent restoration by Rod and Kathy Dierking, it must look very much as it did when it was first completed. The two storefronts are identical in design. There are two decorative columns with ornate capitals on each side of the set-back storefront entrances. The large windows along the property line as well as the two which flank each side of the doorways sit below a series of hexagonal multi-light transom windows. The double doors for each entrance, while not original, are very much characteristic of the period and complement the storefront very nicely. Below the large windows are original vents, which were revealed when the brick façade below the windows was removed. The building is unified by a decorative brick parapet, divided into thirds by three arched corbel tables, the center table raised above the other two. Just below the center table is a long rectangle of brick slightly set back from the rest of the façade. The history of this building is quite intriguing. Since the two storefronts were not unified into one business until 1959, each one will be discussed individually. 342 Orange Street, the storefront to the south, was first occupied by Fulkerson Hardware. By 1902 it had changed to Sering Hardware, which it remained until around 1912, when it became a grocery. Several grocers occupied the space, the last of which was Dunniway’s Grocery, which was there for the entirety of the 1920’s. However, beginning in the early 1930’s it became vacant, perhaps a victim of the country’s Great Depression. By 1947 the space was again a Hardware store – this time Kincaid Hardware and Furniture. This only lasted a few years, because by 1950 it was Parker’s Music. This endeavor only lasted until the mid-1950’s, and again the store was vacant. Finally, in 1959 Ralph Wybenga opened Ralph’s Bargain Spot, the longest-running business in the building, which lasted until 2001. Ralph unified the two storefronts by adding a doorway between them in 1959. The history of 344 is somewhat more interesting. The first recorded business was a firm was Kline and Underwood, who were Tinners. However, by 1909, something quite extraordinary happened: it became a pool hall and barber shop run by a Japanese immigrant named T. Honma. During this period, a number of Japanese had come to Redlands as a source of labor for the area. The area roughly around Central Avenue between 8thand 11th Streets became populated by many of them, in dwellings, boarding houses, and tenements, according to Sanborn maps from the period. The pool hall no doubt served as an important institution for the largely male community. >From this time until around 1931, it was operated by a number of different proprietors, with names like Kawano, Maruya, Takanosuke, Oka, Misaki, Uchida, and Itaya. Perhaps due to the growing nativism of the 1920’s, and the depressed economy of the 1930’s, the tenements were eventually torn down, the Japanese population dwindled, and later, with the onset of World War II, Japanese were forced to leave the area and relocate to Internment Camps and other parts of the country. By 1933, the pool hall was operated by Mexican and Mexican-Americans. Over the course of the next several years it was also briefly Milton Noriega’s restaurant, but the shop failed by the end of the decade. It sat vacant, and later opened as the Azteca Pool Hall and Barber Shop. It remained such until 1959, when the storefront was united with that of 342 to become Ralph’s Bargain Spot. The Redlands Area Historical Society is pleased to honor Rod and Kathy Dierking for restoring and preserving a landmark valuable to the many and diverse communities of Redlands.